Advances in breast cancer research — including some illuminating studies published this week — offer physicians and patients a growing set of tools for both diagnosis and treatment, several experts told Axios. The big picture: As doctors further understand the complicated subtypes of breast cancers, many have been able to rely less on the more traditional, aggressive treatments (such as radical mastectomies), while trying new strategies of testing and targeting specific tumors or cancer subtypes. Breast cancer is the second-most common cancer in women, and research is continually uncovering more about its complicated slate of types that contain a multitude of subtypes. Breast cancer research led the way with precision medicine when researchers found a difficult-to-treat cancer (called HER2 positive) was successfully treated by the antibody trastuzumab — dropping the risk of recurrence by 50%, according to Elizabeth Mittendorf, director of the breast immuno-oncology program at the Dana-Farber Cancer Institute and scientist for the Parker Institute for Cancer Immunotherapy. "That’s a true home run." This was followed by approvals for various drugs that inhibit the proliferation of cancer cells (such as CDK4/6 inhibitors for people with HR+ breast cancer, and PARP inhibitors for patients with tumors from BRCA mutations). These often buy patients more time. "For cancer patients, a wealthy person is one who has extra time, not money." However, there are also many failures. Some trials (such as those of PI3K inhibitors) showed disappointing results. 1. TailorX study — A large trial involving 10,200 women detailed Sunday in the New England Journal of Medicine found that 70% of women with the most common type of breast cancer benefit just as much from hormone therapy as they do with chemo added to the therapy, so many patients may opt to forego chemo. "This really is a great example of precision medicine where we can make treatment decisions based on the biology of an individual patient’s tumor," Mittendorf said. The flip side of the coin, according to Larry Norton, study author and oncologist at Memorial Sloan Kettering, is that it also points out the cases where chemotherapy works very well for certain patients. "This is a landmark study and not only because it shows how a molecular test could be used to spare many patients chemotherapy. It also shows that when — in the minority of cases — chemotherapy is needed, it works quite well." 2. NCI's immunotherapy case — There was a lot of buzz this week over the announcement in Nature Medicine on Monday about the successful treatment using immunotherapy on a person with metastatic breast cancer whose prior treatments didn't work — but who has now remained cancer free 2.5 years after her immunotherapy regime. 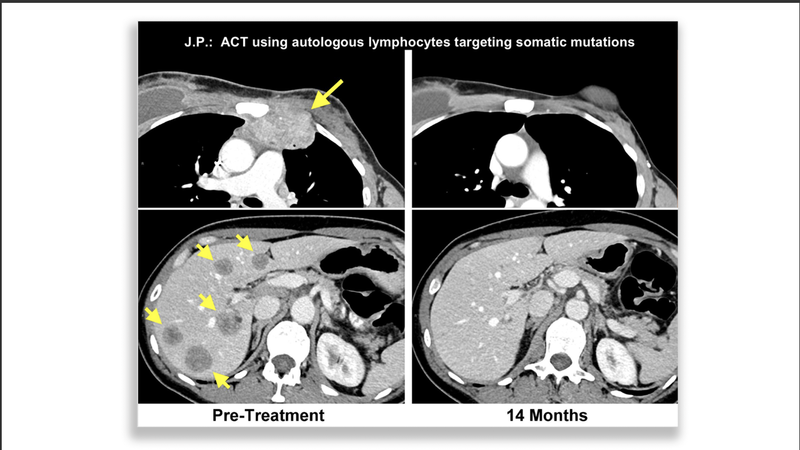 In this trial, the National Cancer Institute team isolated and reactivated the patient's cancer-specific T cells in a process using tumor-infiltrating lymphocytes (TILs) that targeted proteins on the cancer gene. While this study only focused on one patient, there have been two other cases over the past several years — a patient with deadly liver cancer and another with advanced colon cancer — that also saw success via the NCI team, according to the Chicago Tribune. "In my mind, this work provided proof of concept that if you can find the right antigen on the cancer that can be targeted by the immune system, then you can have dramatic responses," Mittendorf said, while adding that larger trials are needed. "[T]he development of this approach holds the best opportunities for finding effective immunotherapies for patients with the solid cancers that last year caused over 500,000 deaths in this country." However, several scientists pointed out the regime worked on one person in this study based on genomic profiling — and individual outcomes are not enough to form a solid opinion. "The result obtained here is fantastic news for this one patient, however the entirety of the research needs to be presented to form an opinion about who might benefit from this innovative approach." 1. Genetic testing — Ross says genetic testing has become more affordable for a full panel test (roughly $250), and can inform a person who has cancer if they are predisposed for additional cancers based on genetic mutations. "I think offering all cancer patients a genetic test will soon become routine." 2. Liquid biopsies — Research continues for trying to use liquid biopsies to see if a simple blood test looking for circulating tumor DNA or circulating tumor cells would enable doctors to either tell if someone has cancer or see if they are responding to treatment. For instance, breast cancer is currently part of the Cancer SEEK trial. "This is a really exciting field but very much in its infancy right now." 3. Immunotherapy — Early trials looking at using checkpoint inhibitors alone tends to show response rates in the 10% range for most cancers. "With breast cancer, we have not seen a tremendous response rate [via immunotherapy,]" Korde said. She agreed with other experts in saying that most research is now focused on using combinations of immunotherapy with chemotherapy or radiation or other treatments. "The best evidence for even a limited response to immunotherapy in breast cancer is for the patients with the type of tumor that is triple negative... Otherwise, it has not been a success to date," Ross said, while adding NCI's case mentioned earlier, which is based on a different type than normally receptive "is intriguing." 4. Mammograms — NCI is working on enrolling nearly 165,000 women over 2.5 years to compare the benefits of 2D vs. 3D mammograms. Korde said breast MRIs are also recommended for women with known genetic hereditary risks. The bottom line: Breast cancer research is expected to get more and more personalized as research continues to pour in. "[W]e need a new paradigm for cancer therapy — that highly personalized treatments are likely to be necessary if we are to make progress in treating common cancers." Go deeper: Read about the challenges and successes faced by cancer immunotherapy.